Starting a business with a partner can be highly beneficial: collaborations offer many benefits and are particularly popular with startups and firms providing professional services. When you start a business with another person or people, the last thing you expect is to end up in a disagreement about business ownership. 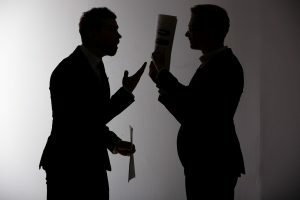 Unfortunately, these kinds of disputes arise on a regular basis and can have a significant impact on the success of your business as well as your personal bottom line. Of course, these conflicts can arise in other ways as well. Fortunately, a skilled attorney can help avoid and resolve these issues in a way that ensures that your interests are protected. Of course, the best course of action is to avoid business ownership disputes entirely. While you can never account for the conduct of others, careful legal planning can help minimize both the chance that a dispute will arise as well as the potential fallout from an ownership conflict. Consequently, it is highly advisable for entrepreneurs and established business people who are entering into ownership agreements to meet with an attorney in the early stages of any venture. An attorney can help negotiate terms and draft and execute contracts that clearly define each party’s role, authority, responsibility, as well as accounting for dispute resolution. In the event that a conflict arises between you and a co-owner of your business, it is important to speak to an attorney right away – even if you doubt that the issue will go to court. In fact, retaining an attorney can often help avoid the need to resort to litigation, which can be costly and extraordinarily disruptive. An attorney will assist you in understanding the rights and obligations that you and your partner have. Furthermore, should your business dispute go to trial, having a qualified attorney in your corner will ensure that your legal rights are protected and that your case is resolved as favorably as possible. Business ownership disputes can be complicated, expensive, and should be avoided at all costs. Fortunately, careful planning with the advice of a Silicon Valley Business attorney can help avoid these kinds of disagreements. Additionally, if you are already involved in a conflict with a business partner, you should retain an attorney immediately. To schedule a consultation with one of our lawyers, call Structure Law Group today at 408-441-7500.